The GYMNASTICS EXPRESS is a very large school bus which is totally remodeled inside. All of the bus seats have been removed. We now have an area to teach gymnastics class that is 7 feet wide by 28 feet long. There is a nice cushioned, carpeted floor area for tumbling. We also have specially designed pre-school equipment that we bring in the bus each week for class. 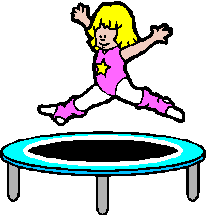 This equipment includes: balance beam, bars, mats for tumbling, stair steps, mini-tramp, trampoline, and various other pre-school fun shaped mats ﻿such as a huge donut, incline mat, mail box, octagon barrels, a box and spring board used for vaulting. By bringing ﻿this equipment we will be able to teach all of the Olympic Events: balance beam, horizontal bar, floor (tumbling), vaulting, still rings, and parallel bars. Our colorful "Fun Shaped Mats" are designed to teach and excite the student when learning the concepts of Gymnastics. While learning basic Gymnastics, the pre-schooler develops strength, coordination and self confidence. In our "GYMNASTICS EXPRESS" bus we also teach many basic skills and words which are important to the child in everyday life. There are skills such as waiting their turn, praising others, being rewarded for good behavior and following directions. Common words we use which the children will become familiar with are words such as over, under, around, behind, in front, beside, beginning, end and many, many more. We feel that we not only introduce them to the sport of gymnastics but also teach them some basic skills of everyday life. In January of 2010 we implemented more activity into the GYMNASTICS EXPRESS bus. We are now teaching the fundamentals of a variety of different sports. 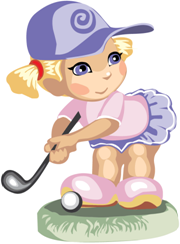 Along with gymnastics, we are teaching the basics of soccer, baseball, basketball, tennis, volleyball, football, golf and bowling. This gives your child the opportunity to explore all these activities all at one low cost. Gymnastics Expresss has been in business in the Columbia area since the fall of 1989 when we moved here for Jeff to become the Assistant Women's Gymnastics Coach at the University of Missouri. Jeff coached the team at Mizzou from the fall of 1989 until the spring of 1999. That year he left the University to focus on Gymnastics Express. The originator and teacher of the "GYMNASTICS EXPRESS" is Jeff Conner. Jeff has been involved in the sport of gymnastics for over 45 years, first as a high school and collegiate gymnast and later as a high school and college coach. He also owned a private gymnastics business in Iowa for 13 years before moving to Columbia in the fall of 1989. Jeff's wife Kathy teaches in the bus as well. Kathy has been working with children in gymnastics since 1986 and has also been active as a gymnastics judge through the United States Gymnastics Federation (USGF). Both Jeff and Kathy are Safety Certified by the USGF.